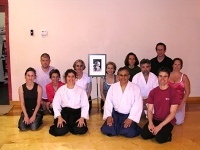 Yuwakan is the only Aikikai-affiliated aikido dojo in Houston Heights area. Our official dojo name, given by Shihan Hiroshi Kato in 2007, is Yuwakan. It means a training hall to cultivate friendships and harmony. In Lakota Native American folklore, it also means "moving away from profane and mundane to sacred and spiritual". We like both these meanings.